The War of 1812 Explore the causes of the war. The Americans Learn about the American Commanders and Defenders. View Star-Spangled Banner Trail The trail in a modern day overlay. Instructions How to use this map. Credits What was used to create the map. Bring the Battles Home Download each as a PDF. using a high bandwidth connection. Star-Spangled 200 is a multi-year commemoration that celebrates the 200th anniversary of our national anthem. Star-Spangled Sailabration in Baltimore’s Inner Harbor and the Chesapeake Bay launched the events in June 2012. Sailabration included a maritime festival with 45 vessels from a dozen nations and an airshow featuring the Blue Angels, and drew more than 1.5 million visitors. Or, view the sponsors and press pages directly. The Star-Spangled Banner National Historic Trail is a 560-mile land and water route that tells the story of the War of 1812 in the Chesapeake Bay region. It connects historic sites in Maryland, Virginia, and the District of Columbia and commemorates the events leading up to the Battle for Baltimore, the aftermath of which inspired Francis Scott Key to write our National Anthem. The trail traces American and British troop movements, introduces visitors to communities affected by the war, and highlights the Chesapeake region’s distinctive landscapes and waterways. Alexander & Tom, Inc. was founded in 1996 with the goal of combining marketing skills and web technology to provide innovative and effective communications. We combine the most advanced web technologies with marketing experience and effective design to create easy-to-use, highly functional, and engaging web campaigns and web tools. Our experience in website development, database integration and online media delivers our clients a true competitive advantage. We are named after the great inventors Alexander Graham Bell and Thomas Edison, two gentlemen who used technology to change the world. We are an award-winning team for both our aesthetic achievements and our online technology achievements. During the first decade of the nineteenth century Great Britain was mixed up in a high-stakes economic war with Napoleonic France. When England issued the "Orders-in-Council," a series of restrictions aimed at stifling trade with France, Napoleon responded with his own decrees know as the "Continental System." Both Great Britain and France restricted neutral nations such as the United States to trade with their enemy. Over the next five years hundreds of American ships were seized by the two warring nations and their allies. The war with France and its allies created a critical demand for seamen to crew Great Britain's huge navy. Stopping American ships to look for British deserters became routine on the high seas. Between 1803 and 1812, an estimated four hundred American ships were stopped and some estimates claim as many as six thousand American citizens were impressed into the British navy. 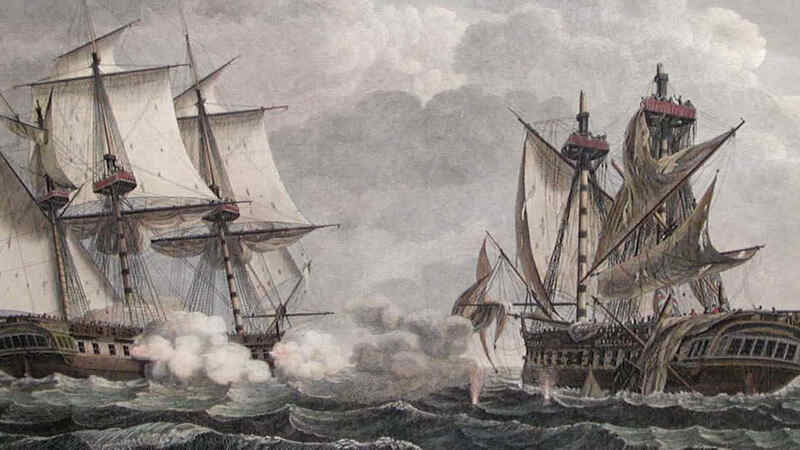 When H.M. frigate Leopard attacked U.S. frigate Chesapeake in 1807, after it refused to allow a search for deserters, Americans became outraged and the event helped fuel the call for war. "The time is come to humble the overgrown monsters [the British] — and to cause our republic to be respected at home and abroad." 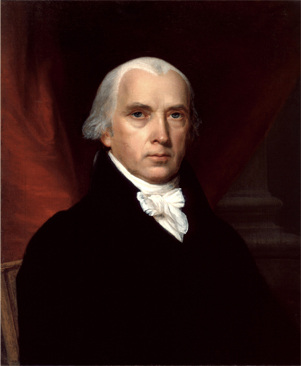 In 1809, Thomas Jefferson left the presidency to his handpicked successor, another founding father named James Madison (1751-1836). The fourth U.S. president was a small, unassuming man with a great mind. His influence on the U.S. Constitution was legendary, but he was a far from confident public figure. Trembling and pale at the inaugural ceremony, he labored to project his voice to the audience straining to hear his address. It was up to his spirited, attractive wife, Dolley (1768-1849), a pioneering first lady, to give the new administration some vim and vigor. President Madison promised peace with honor, but he was faced with the same challenges that had all but brought down his predecessor. Like Jefferson, he believed that "no nation can preserve its freedom in the midst of continual warfare." But France and England remained intractable. The cautious, often indecisive, new president was no match for Napoleon Bonaparte and cagey, duplicitous British foreign ministers. The young U.S. republic was the ball in a game of diplomatic ping pong, bouncing from one frustration to another. To make matters worse, Madison had an ineffective secretary of state in Marylander Robert Smith (1757-1842). When the president replaced Smith with James Monroe (1758-1831), relations with Great Britain continued to worsen. In mid-1811, another incident at sea had British newspapers calling for revenge for "the blood of our murdered countrymen." The 44-gun U.S. frigate President, commanded by Marylander John Rodgers, had fired at night on the smaller H.M. sloop-of-war Little Belt, leaving behind thirty-two casualties. — General Zebulon Pike mortally wounded at York (present-day Toronto) April 30, 1813. There was a French population in Lower Canada (now Quebec) as well as a large number of Americans who had migrated north after 1792 to take advantage of liberal land policies and low taxes. Under these circumstances, the conquest of most of Canada was expected to be, in the words of Thomas Jefferson, "a mere matter of marching." Once the United States conquered Canada, the British would have to concede the maritime issues in order to get their territory back. If they refused, then Canada might be permanently annexed. There would be little that the British could do about it since they were busy fighting Napoleon in Europe. Events, however, did not play out as Republicans had anticipated. The British repealed the Orders-in-Council, lifting the trade restrictions just as the United States was declaring war. However, Great Britain refused to make concessions on impressment. 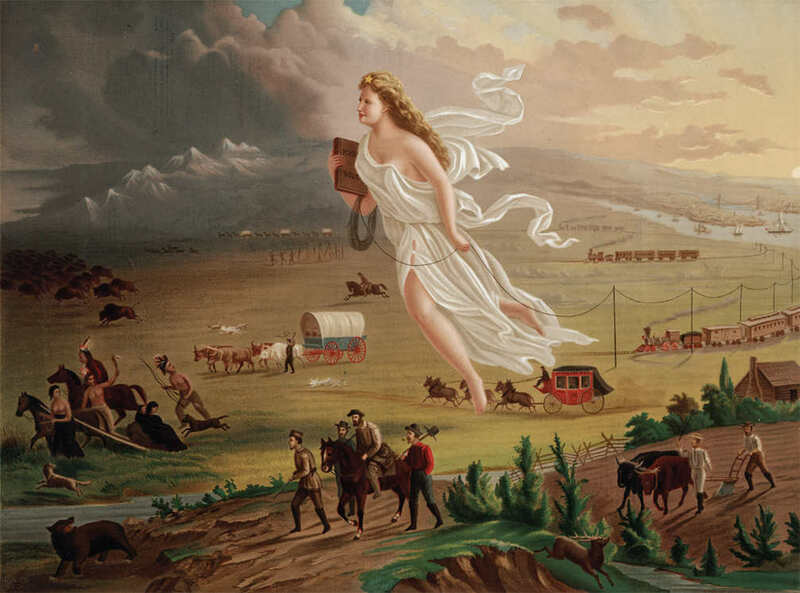 The U.S. launched a three-pronged invasion into Canada in 1812, but it ended in failure. A similar invasion in 1813 was successful in the West, a theater of operations so remote that the victories did not alter the course of the war. "The enemy robbed every house of everything valuable that could be carried away." Although the British had been on the defensive early in the war, they used their naval power to conduct predatory raids on the Atlantic Coast. Their aim was to draw off American regular troops from the Canadian invasions and bring the war home to Americans. While they failed to force the redeployment of any American soldiers from Canada, Britain showed Americans on the eastern seaboard the perils of waging war against the mighty Mistress of the Seas. "A Hero of Both Wars for Independence." Smith served as a major general of Maryland militia during the War of 1812, and commanded the defenses of Baltimore during the Battle of Baltimore and Fort McHenry. The American victory there can largely be attributed to Smith’s preparation for the British invasion. Born into the sturdy families that settled frontier Pennsylvania, Smith was raised in Baltimore. At twenty-five he was already commanding a fort defending Philadelphia during the Revolution and winning praise from the Continental Congress for his bravery. 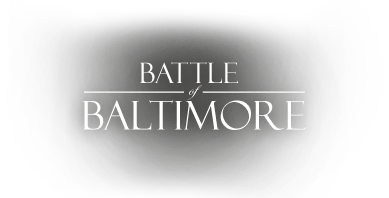 After the war, the hero took full advantage of Baltimore’s growth and became a power broker in the shipping business. Beginning his political career as a Federalist, the party of George Washington, Smith joined the Jeffersonian revolt in 1800 but always remained a maverick who opposed many of the Jefferson and Madison policies. As a born leader, he moved easily into politics and was a powerful and influential force in the U.S. Congress, serving both as a congressman and a senator almost continuously from 1793 until 1833. Through the tempestuous days of the Quasi-War with France and the Whiskey Rebellion, Samuel Smith also found time to serve the nation as an officer in the Maryland militia. In 1813, the sixty-one-year-old elder statesman took over Baltimore’s defenses and he became the highly popular and effective choice to command the forces that repelled the British in 1814. After spending almost his entire career in public service, the venerable eighty-one-year-old veteran of two wars against Great Britain still had enough drive and energy to lead a troubled Baltimore as mayor (1833–1835). Only a handful of founding fathers can claim so much influence and success during the first fifty years of the United States. Stricker was born in Frederick, Maryland, the son of a militia general who also fought with George Washington. When only seventeen years old, John marched to the fighting at Princeton with the 1st Maryland Regiment. Along with other veterans, he proudly wore his blue Society of Cincinnati Medal, identifying him as one of the small fraternity of officers who had risked everything serving under General Washington. John Stricker’s career during the War of 1812 swung between two extremes. Within days of the declaration of war against the British, there was a riot in Baltimore that highlighted the dangerous division among Americans on the issue of going to war. General Stricker was then in command of the local militia charged with intervening and preventing bloodshed. Sympathizing with the rioters, the general dragged his feet before calling out the militia. The result was a night of mayhem and death that tarnished the whole town’s reputation. Just two years later, General Stricker was serving under General Smith. Sent out with a brigade to slow down the British land attack and buy time to strengthen the city defenses, Stricker handled the assignment with enviable patience and skill. 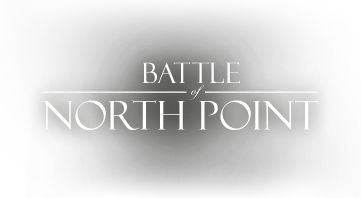 He created one of the memorable moments for the Baltimore defenders at the Battle of North Point. In spite of his early war lapses, General Stricker won an honored place among the memorial portraits of the leading 1814 defenders. "To content himself with following the plough ... while the blast of war was blowing in his ears, would have been ... altogether contrary to his nature." Joshua Barney rarely sat still for long. From the time he first went to sea at age thirteen, the Baltimore native was a magnet for adventure on the high seas. At sixteen, he commanded a ship that was caught up in a Spanish campaign against Algiers. His experiences during the Revolution, while he was still in his teens, made Barney an American hero. Captured three times, he was held on a notorious prison ship and escaped his captors twice. As the war ended, he fought and won a spirited sea battle, then carried secret messages to and from France during the peace negotiations. The French were so impressed with Barney, they hired him to run their West Indies Squadron in the 1790s. Retired from the sea, and after years of success as a Baltimore merchant trader, the veteran mariner launched his most important adventure. As another war began in 1812, Barney was at sea again, commanding the legendary Baltimore privateer Rossie and preying on British shipping. During the summer of 1814, Barney, now commodore of the U.S. Chesapeake Flotilla, bravely engaged the mighty Royal Navy. Under orders from the Secretary of Navy, the flotillamen scuttled their gun barges in the face of overwhelming odds, Barney and his flotillamen marched to Bladensburg and won British respect with their determined defense of the road to the Federal City. Seriously wounded at the battle, the commodore was headed for new adventures in Kentucky when he finally succumbed to the Bladensburg wound in 1818, thus ending his remarkable life. 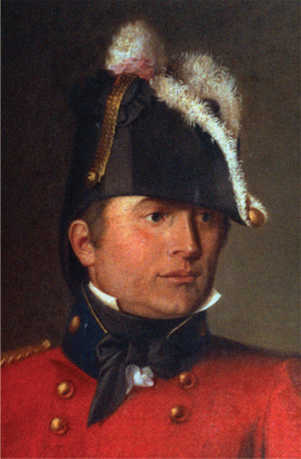 Barney’s posthumous portrait, depicting him as an honored 1812 defender, reveals an active gentleman with tousled hair and a ruddy complexion. He confidently grasps his side sword and proudly wears his Society of Cincinnati Medal, marking him as a decorated veteran of the Revolution. Early America had only a handful of heroes who measure up to the bold achievements of Commodore Joshua Barney. — President James Madison, Secretary of the Navy William Jones, Brigadier General John Hungerford, and U.S. Navy Captain David Porter, Jr. The fourth U.S. president was a small, unassuming man with a great mind. His influence on the U.S. Constitution was legendary, but he was a far from confident public figure. Trembling and pale at the inaugural ceremony, he labored to project his voice to the audience straining to hear his address. It was up to his spirited, attractive wife, Dolley (1768–1849), a pioneering first lady, to give the new administration some vim and vigor. President Madison promised peace with honor, but he was faced with the same challenges that had all but brought down his predecessor. Like Jefferson, he believed that "no nation can preserve its freedom in the midst of continual warfare.” But France and England remained intractable. The cautious, often indecisive, new president was no match for Napoleon Bonaparte and cagey, duplicitous British foreign ministers. The young U.S. republic was the ball in a game of diplomatic ping pong, bouncing from one frustration to another. 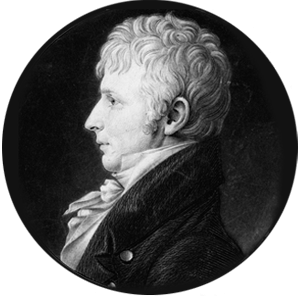 To make matters worse, Madison had an ineffective secretary of state in Marylander Robert Smith (1757–1842). When the president replaced Smith with James Monroe (1758–1831), relations with Great Britain continued to worsen. 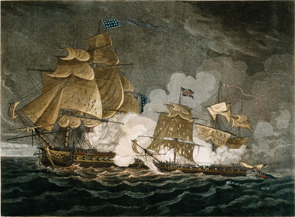 In mid-1811, another incident at sea had British newspapers calling for revenge for "the blood of our murdered countrymen.” The 44-gun U.S. frigate President, commanded by Marylander John Rodgers, had fired at night on the smaller H.M. sloop-of-war Little Belt, leaving behind thirty-two casualties. "Hated and feared by the enemy ... revered and beloved by his countrymen." 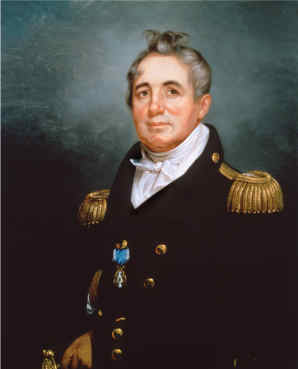 Commodore Rodgers was senior naval officer on active duty when war broke out with the British in 1812. After a bloody engagement on the high seas, Rodgers won more fame on land in 1814. 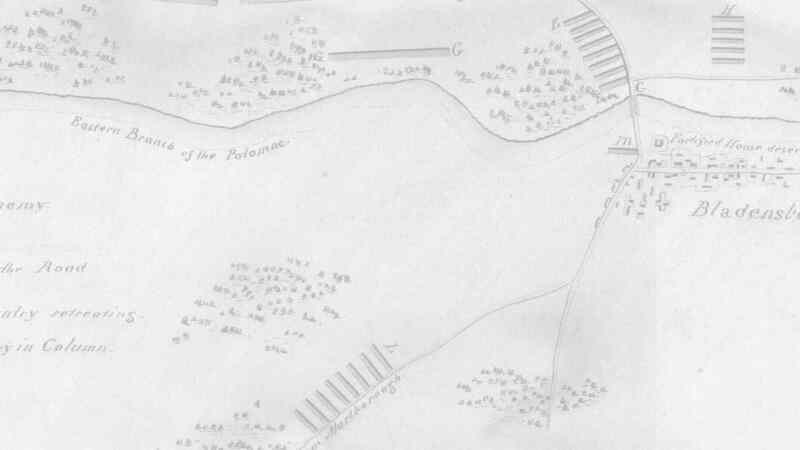 Taking charge of the naval aspects of Baltimore’s defense, he commanded one of the key bastions along the well-prepared mile long defenses centered on Hampstead Hill (now Patterson Park). With his illustrious fighting years behind him, John Rodgers served for decades as the head of the newly created U.S. Board of Navy Commissioners. The Commodore’s family became a U.S. Navy dynasty as his son commanded ironclads during the Civil War; his grandson was an admiral in World War I and his great grandson a naval aviator. Sion Hill, the Federal-style home still privately owned by descendants of the Rodgers family, stands on a hill overlooking the Chesapeake Bay. American Brigadier General William Winder was a controversial officer in the U.S. Army called up for a military emergency. General Winder, of Somerset County, Maryland, was a lawyer by trade. He practiced successfully in Baltimore before the War of 1812. Winder was sent to the Niagara frontier as an army colonel then promoted to brigadier general. In his first combat in 1813, he was captured during the night battle at Stoney Creek and spent most of a year as a prisoner of war. 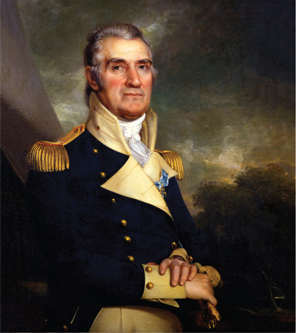 When exchanged in 1814, Winder was placed in charge of the 10th U.S. Military District defenses, which included Maryland and Washington. The promotion by President Madison undoubtedly was designed to curry favor with the general’s uncle, Maryland’s Federalist Governor Levin Winder who was against the war, and the Republican leadership in the U.S. capital. 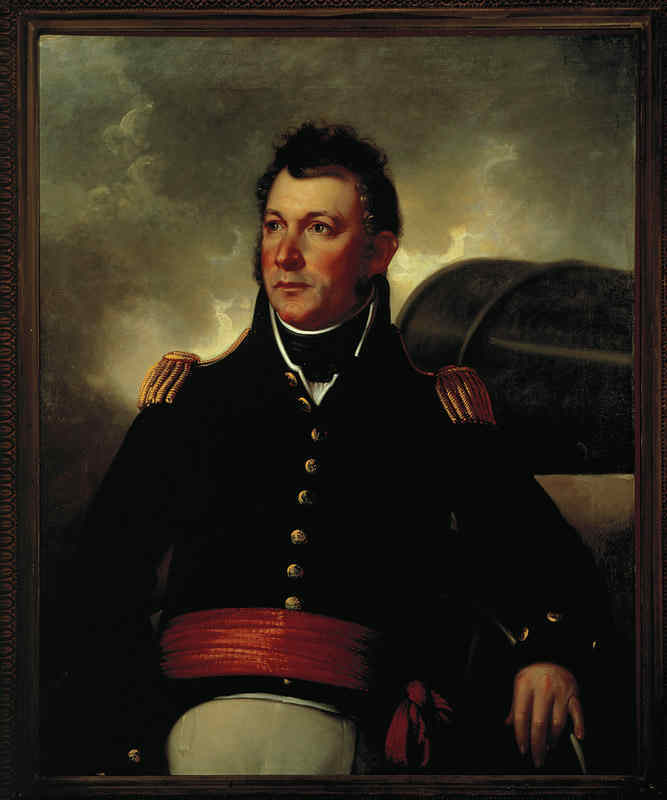 George Armistead, the commander of Fort McHenry during the British bombardment, emerged from the War of 1812 as one of its great popular heroes. He entered the U.S. military in 1799 and rose through the ranks, serving at multiple sites across the country. 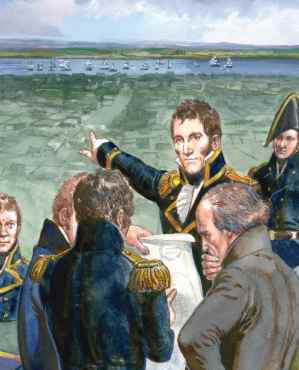 Armistead assumed command of Fort McHenry in early 1814. His command included the fort itself, the Lazaretto Battery directly across the channel, and a small flotilla of gunboats. In the days just prior to the British attack on September 13, Armistead had little time for sleep as he organized his defenses. The British began their 25 hour bombardment of Fort McHenry on the morning of September 13, 1814. 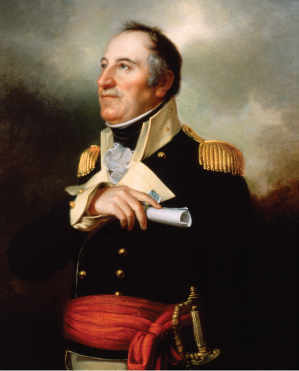 While the British ships sat out of range of the fort’s cannons and rained fire into the fort, Armistead did everything he could to increase the range of his guns. By about 10:00 A.M., Armistead concluded there was nothing he could do but ride out the firestorm. The firing continued throughout the night. On the morning of September 14, the British stopped firing on the fort. Armistead then ordered the large garrison flag raised over the ramparts of Fort McHenry. Four years later, at the age of thirty-eight, Armistead died of causes unknown and was buried with full military honors by a grateful city. Not all of the slaves who fled or were taken from Chesapeake plantations joined the British. Before Bellefields Plantation owner Benjamin Oden escaped from the British invasion with his slaves in August of 1814, he was seeking a runaway named Frederick Hall. It appears that the light- skinned, 22-year-old Hall could and did pass as a white man. He soon appeared as Private William Williams on the muster rolls of the 38th Regular U.S. Infantry. He collected his $50 cash bonus for enlisting and private’s wages of $8 a month. 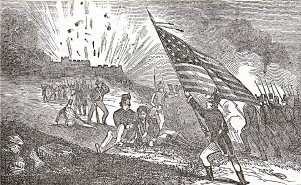 On September 13–14, 1814, Private Williams was stationed with his company in Fort McHenry's dry moat, enduring the British bombs and rockets raining down on the Americans. An incoming bomb blew his leg off, and he died two months later in Baltimore Public Hospital, one of the few casualties of the daylong bombardment. How do we know the story of this escaped slave turned American soldier? Determined not to lose his investment, Benjamin Oden later tried to claim the 160 acres of land due Private Williams’s heirs for his military service. Congress denied Colonel Oden’s request, claiming that he had not tried hard enough to find and recapture his escaped slave. 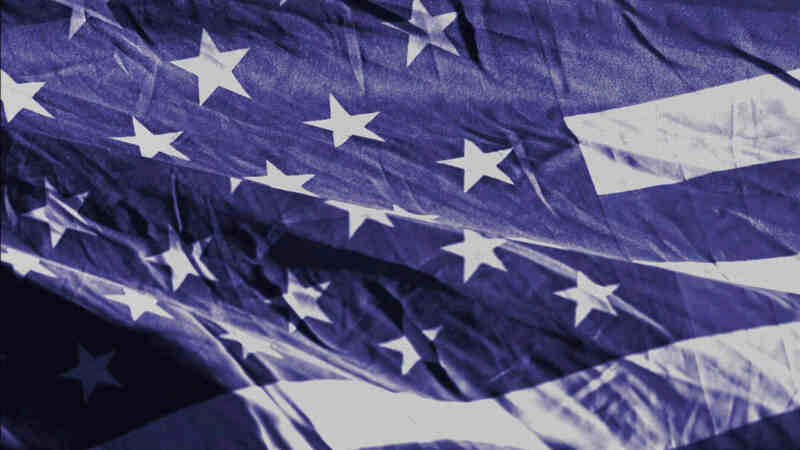 Major George Armistead, Fort McHenry’s commander, ordered a new garrison flag (30 feet by 42 feet) along with a smaller storm flag (17 feet by 25 feet). The job went out to a 37-year-old widow, Mary Pickersgill, an experienced ship and signal flag maker. In 1813 she labored for seven weeks with her 13-year-old daughter, Caroline, two nieces, 13-year-old Eliza Young and 15-year-old Margaret Young, a 13-year-old African-American indentured servant, Grace Wisher, and possibly her mother, Rebecca Young, who had taught her the trade. 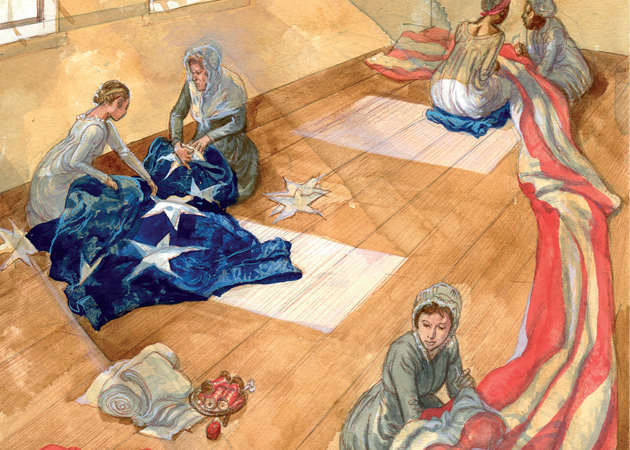 They pieced together strips of loosely woven English wool bunting then laid the whole flag out on the expansive floor of a brewery near Mrs. Pickersgill’s Pratt Street house, now the Star-Spangled Banner Flag House Museum. "Does not such a country, and such defenders of their country, deserve a song?" It all began with an arrest. Sixty-five-year-old Dr. William Beanes (1749–1828) of Upper Marlboro was a respected physician and Revolutionary War veteran well known in the Washington region. He had cordially entertained both Major General Robert Ross and Rear Admiral George Cockburn when the British Army had marched through on its way to attack Washington. The trouble began when the British were returning to their ships. Enemy stragglers and at least one deserter were looting in the neighborhood and Dr. Beanes helped local citizens arrest the troublemakers. The British brass was not amused by what they considered a betrayal. Dr. Beanes, arrested while in his bed, soon found himself and two companions in irons onboard a Royal Navy ship. Richard West, a close friend of the doctor’s, hurried off to Benedict to plead for Beanes’s release, but his efforts were rebuffed. 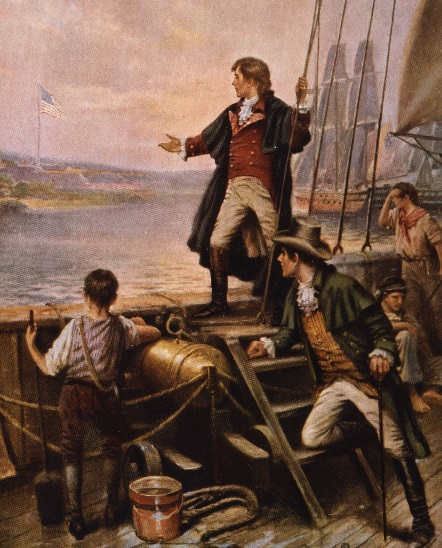 West then approached his brother-in-law, the influential young Georgetown lawyer, Francis Scott Key, for assistance. Born in Frederick County, Key, a pious man who had considered becoming an Episcopal priest, had attended St. Johns College in Annapolis. He was well connected in the Federal City. A member of the D.C. militia, he had served as a civilian aide at the Battle of Bladensburg. Key met with President Madison, who then met with Brigadier General John Mason, the commissary general of prisoners. They approved a mission to seek the release of Beanes and requested that Key accompany American Prisoner Exchange Agent John Stuart Skinner. Skinner had conducted many dealings with the British and was familiar with the commanding officers. After obtaining letters from British wounded attesting to the good treatment they had received at Bladensburg, Key and Skinner left Baltimore on a truce ship and sailed south to the British fleet near the mouth of the Potomac River. Boarding Vice Admiral Alexander Cochrane’s flagship H.M. ship-of-the-line Tonnant, the party was greeted coldly by the senior British officers when the purpose of their mission was revealed. At first General Ross was unwilling to release the doctor, but when shown the letters from wounded Englishmen lauding their medical treatment, the general and his naval colleagues agreed to let Beanes go. However, the doctor and the truce party were detained to prevent them from reporting the British plans to attack Baltimore, which they had been privy to. As the enemy fleet traveled north up the Bay, the three Americans were placed on H. M. frigate Surprise with their truce boat and crew towed behind. — Dr. Beane helped arrest enemy stragglers that were looting Upper Marlboro after the burning of Washington, D.C. In 1812, the United States had a relatively small number of professional soldiers in the still-young U.S. Army. The U.S. Navy, also only a few decades old, had both sailors and marines serving in its fleet of frigates and smaller vessels. Members of the Revenue Cutter Service, predecessor of the U.S. Coast Guard, were placed under the command of the U.S. Navy during the war. At the beginning of the war there were about 7,000 U.S. Army troops. By war’s end, that number had increased to about 35,800. The Chesapeake Flotilla, a gunboat unit of the U.S. Navy raised during the war to protect coastal areas, had about 1,000 sailors. 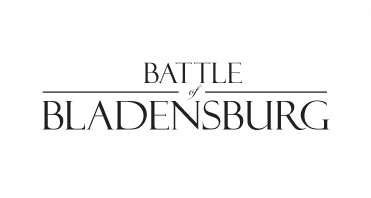 Just over 100 U.S. Marines are known to have fought in the Battle of Bladensburg. The bulk of the defense was placed on the shoulders of part-time militia, citizen-soldiers with limited training and usually no combat experience. 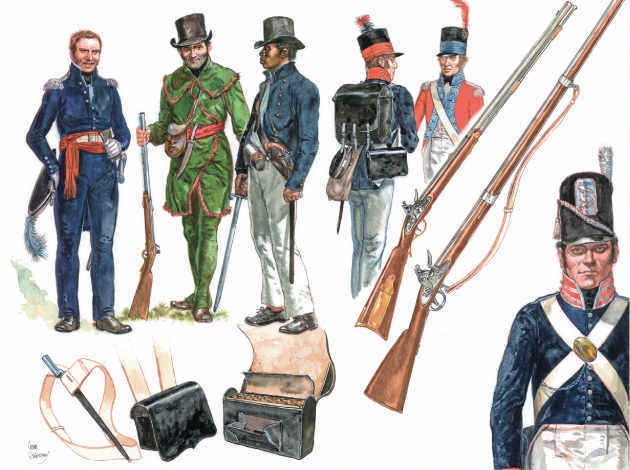 — (top from left) a U.S. regular infantry senior officer wearing the plain and practical uniform that was favored as the war progressed; a Maryland militia rifleman; a flotillaman, armed with typical cutlass, cartridge box, and a pistol clipped to his cutlass belt (his uniform and armaments are almost identical to his British counterpart); a private and drummer, 5th Maryland Regiment infantry militia. The standard infantry weapon during the war was the muzzle-loaded smooth-bore flintlock musket. The United States musket typically fired a .69 caliber and the British a .75 caliber soft-lead ball, respectively. To make loading easier, the caliber of the balls they fired were slightly smaller so they could fit down the barrel when loaded inside a paper cartridge; especially as the bore fouled with repeated shots. Naval cannon typically consisted of long guns and carronades. Long guns were larger and heavier and usually were carried on the lower gun decks of ships. 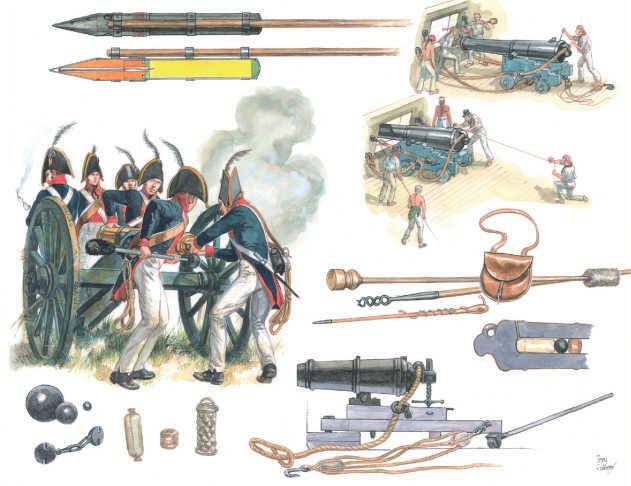 Carronades were short, lighter guns usually carried on the upper gun decks. In addition to solid shot, cannon could fire grapeshot or canister, consisting of multiple smaller-sized lead balls fired at one time. "I don't care if it rains militia"
— Reported to have been said by Gen. Ross when told 20,000 Americans were waiting to oppose British forces. Major General Robert Ross was a seasoned and professional veteran. 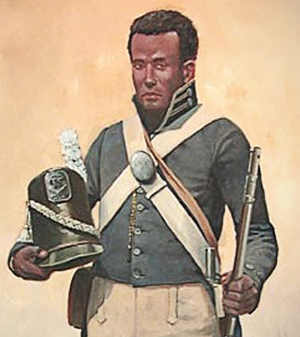 General Ross was the quintessential Napoleonic-era soldier. Born in County Down, Northern Ireland, Ross joined the 25th Regiment of Foot as an ensign after attending Trinity College in Dublin. He had found his calling, steadily advancing in rank as he fought in the Netherlands, Egypt, Italy, and Spain. 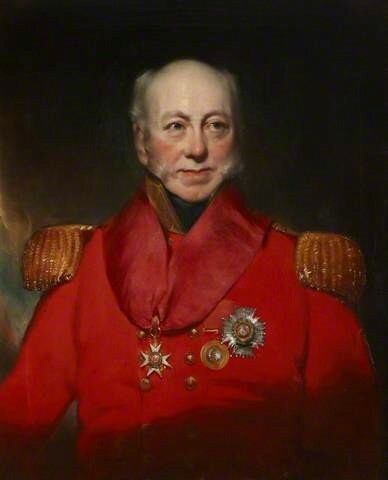 Noted as a tough but fair and popular leader, Ross became a right-hand man to the Duke of Wellington during the bloody 1813 Spanish Peninsular War. Just months before coming to the Chesapeake as a general in command of land forces, Ross was seriously wounded in the neck. "The temple of God — of peace and goodwill towards men — vibrated with the groans of the wounded and dying." 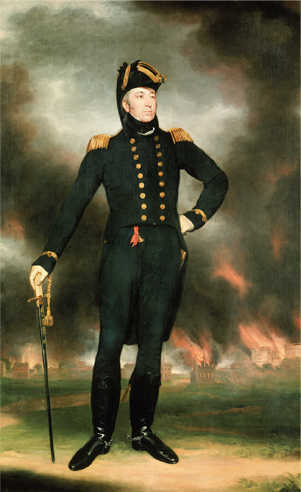 In full uniform, the hated Rear Admiral George Cockburn stands before his proud handiwork, an embellished version of the burning of Washington in 1814. 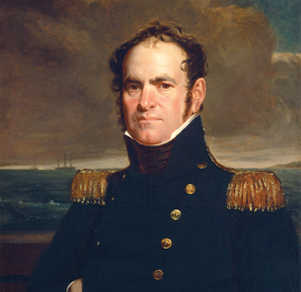 The admiral was a competent as well as ruthless Royal Navy officer, symbolizing the world-class forces brought to punish the Americans during the War of 1812. "If I took the place, I should have been the greatest man in England. If I lost, my military character was gone forever." With Ross’s death, Colonel Arthur Brooke (1772–1843), a 42-year-old Anglo-Irish veteran of the 44th Regiment of Foot, suddenly found himself in command. Yet another admiral who had no love for Americans now took command. 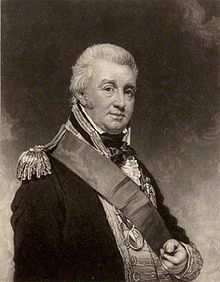 Sir Alexander Forrester Inglis Cochrane (1758–1832), one of the hard-edged British naval officers of the era, had fought in the American Revolution, lost a brother at Yorktown, and had his hat blown off by a cannonball in the 1806 Battle of San Domingo. Now a vice admiral, he was replacing the lackluster Admiral Sir John B. Warren as commander of the North American Squadron. With only three weeks in April to plan an 1814 campaign, Admiral Cochrane was eager to take the war to Americans in the Chesapeake region, in part because of their well-known privateering activities. In the Chesapeake theater, the British used troops representing the Royal Navy, Royal Marines, and British Army. Because of their red jackets, British Army troops were often called Redcoats or, pejoratively, Lobsterbacks. During the British march against Washington and Baltimore, there were elements of four regiments, the 4th, 21st, 44th, and 85th Regiments of Foot, all veterans of fierce fighting against Napoleon in Spain. The invading army had nearly 5,000 men, including soldiers, Royal Marines, and sailors. The British also trained about 550 escaped African- American slaves, called the Colonial Corps or Colonial Marines, who fought valiantly in the 1814 campaign and found freedom after the war in the British Empire. 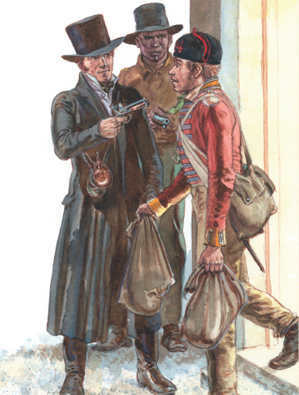 During the 1813 battles of Craney Island and Hampton, Virginia, the British used over 100 French deserters and prisoners of war who agreed to serve as Independent Foreigners. They behaved disgracefully in the battles and were sent back to Europe. 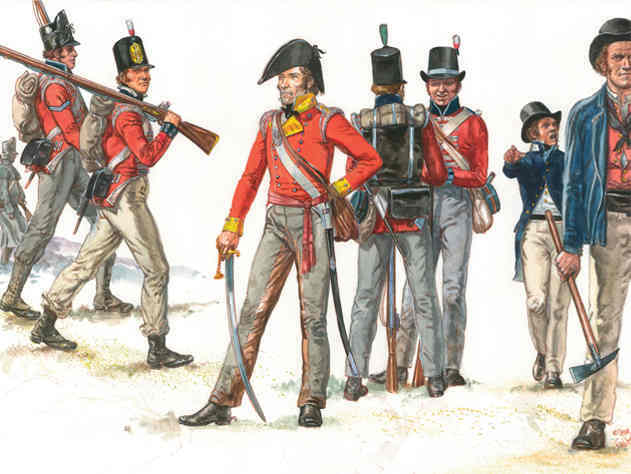 — The various British uniforms. "As you look at her [Chasseur], you may easily figure ... that she is about to rise out of the water and fly in the air, seeming to set so lightly upon it." A thrill spread through Baltimore as reports filtered in and signal flags went up on Federal Hill. Lookouts had spotted the sleek and streamlined Chasseur, one of the city’s famous privateers. As the clipper with her spreading sails came into sight, majestically entering the Baltimore harbor in the late afternoon of Saturday, March 18, 1815, clusters of townspeople gathered on shore to catch a glimpse. This was the brig-rigged schooner Chasseur, the Chesapeake’s foremost high seas predator, soon to be rechristened Pride of Baltimore. Cannon salutes and a cheering crowd at her home port of Fells Point would punctuate the approaching nightfall. This Baltimore haven for privateers could claim that during the amazing events of the previous year it had helped to stave off defeat. Chasseur and her resolute sister ships had boldly carried the war to faraway places throughout the seas. Along with other privateers up and down the Atlantic coast, the civilian fleet had done more damage to British shipping than the small U.S. Navy. Navy warships actually performed better based on a ship-to-ship ratio, but there were many more privateers than U.S. Navy warships. The star-spangled banner of America and the red-cross flag of Britain displayed together at City Hall. 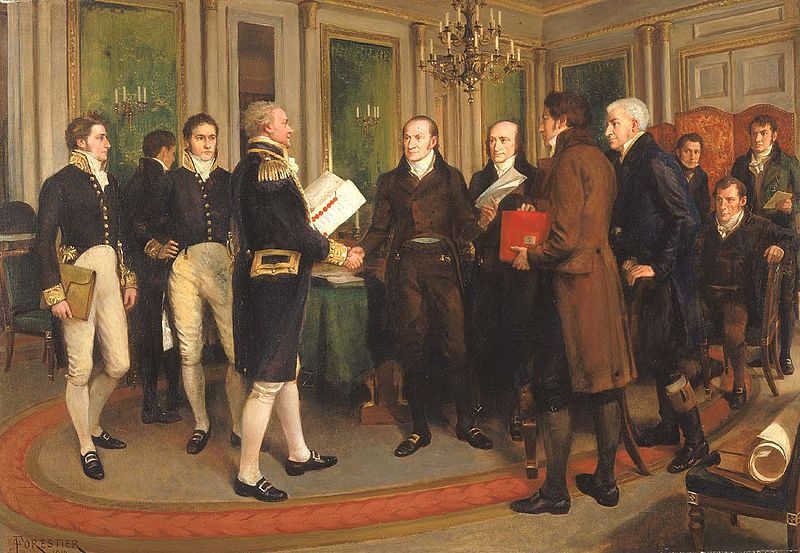 Peace negotiations had begun in August 1814, as the British were preparing to do their worst to the American Republic. The initial terms of peace were laid out in just ten days, but it took until Christmas before both sides agreed and the British ratified what came to be called the Treaty of Ghent. A fast British packet ship, Favorite, delivered the treaty with its American messenger to New York on February 11. The document reached Annapolis on February 13, and a post rider had it on Secretary of State James Monroe’s desk the next day. President Madison may have had misgivings about the treaty. After thousands of casualties, millions of dollars in property damage, several abortive invasions of Canada, unchecked ravages all over the Chesapeake and on the Niagara, most of the government buildings of the U.S. capital laid to waste, fierce Indian battles on the frontier, and threats of secession from New England states, the terms of the treaty called for a status quo ante bellum. Ratification meant returning to the same conditions as before the war. All of the blood and destruction had, on paper, accomplished nothing. Depressed and confronting his personal failure, the president may have considered continuing the negotiations. Madison knew, however, that it would be next to impossible to get a better deal. Studying the document, he also realized that the terms of the treaty could have been much worse for the United States. Besides, the support for "Mr. Madison’s War” had dwindled to new lows. So, surrounded by the plush paneling of the Octagon’s Round Room and buoyed by First Lady Dolley’s always effervescent support, President Madison signed the treaty on Thursday, February 16, 1815. Surviving today as the museum home of the American Institute of Architects, the Octagon House had found its niche in American history. As the news of the treaty spread, the entire country celebrated with a sense of jubilation and relief. The four-decade-old United States had emerged from the contest intact. In Washington, buildings were decked out in patriotic colors and the Stars and Stripes and the Union Jack flew together at city hall. Mayor James Blacke called for a "national demonstration of joy” and, as cannon salutes echoed through town, buildings, bedecked with candles and oil lamps, lit up the night. Other towns celebrated in similar fashion. Baltimore rejoiced with its own version of Congreve rockets that pierced the sky. Alexandria called for a day of thanksgiving, then "brilliantly illuminated” its downtown. Norfolk chose a festive public dinner before lighting its lamps. 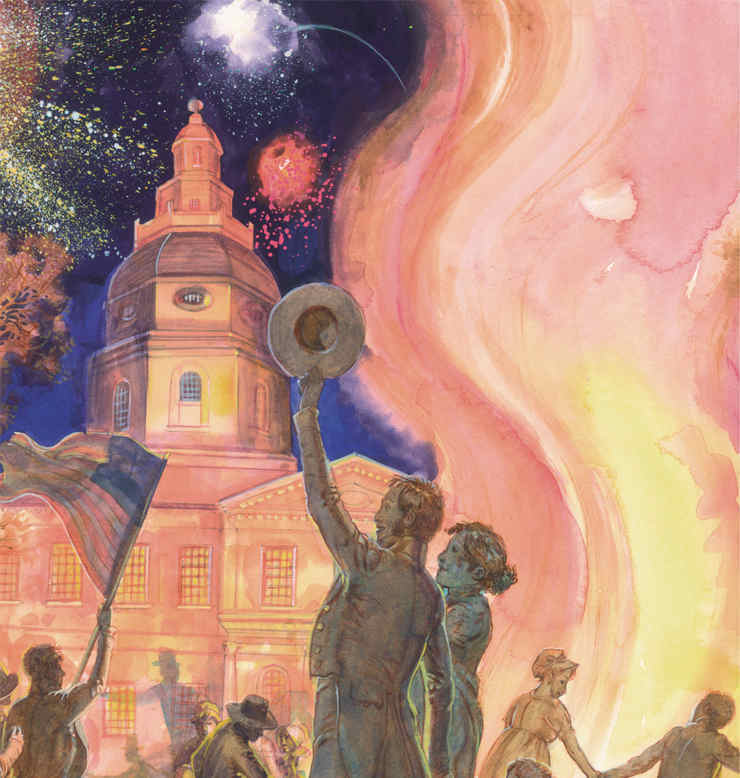 Annapolitans used their prominent, illuminated State House as the centerpiece for cannon blasts, ringing bells, and grand bonfires. The Maryland Gazette reported, "In the midst of this scene of light stood the State House, conspicuous for its elevation and splendor. Portsmouth and Richmond featured new crowd favorites, colored transparencies of patriotic scenes projected against buildings with the aid of gas lamps. Boston filled its streets with the choreographed peals of church bells. As the festivities spread through the nation, a special committee in Baltimore sent congratulations to their beleaguered president. Mr. Madison responded by thanking Baltimore for its "devotion to the public cause." History taught in school tends to emphasize events as separate and distinct. In reality, history runs on a continuum that is better viewed in decades rather than years. Conflicts and issues are not so neatly packaged as the history books would have us believe. 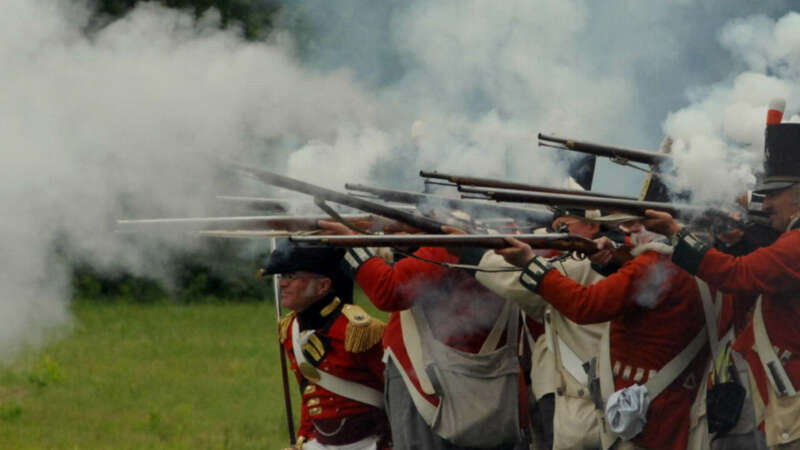 From our position today, it is not hard to see how the French and Indian War soon became the American Revolution and the Revolution foreshadowed the War of 1812. 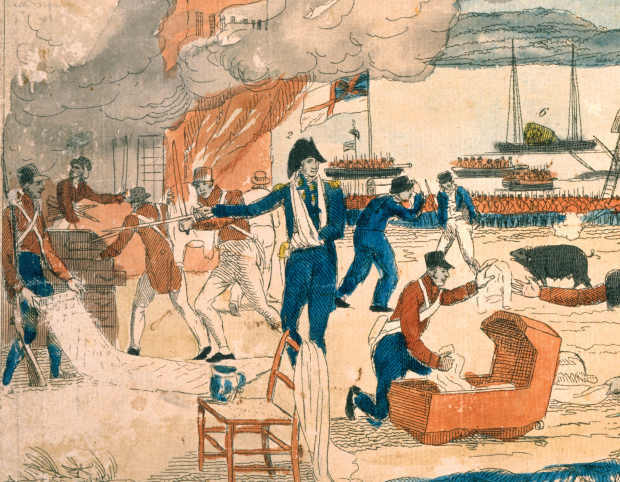 The War of 1812 remains a largely forgotten footnote in the history of the United States. Although most of the fighting occurred between 1813 and 1815, the "War of 1812” label stuck. Attempts to call it something else, like "the second war for independence” have met with some success, but the emphasis on "independence” overstates the threat posed by the British in the early 1800s. It is not difficult to find some important, even critical benefits that changed America during its self-created misadventure known as the War of 1812. After suffering about 6,765 battle casualties over nearly four years and an estimated cost to the country of $158,000,000, including property damage and lost economic opportunities it could ill afford, the United States was a different nation in 1815. The Treaty of Ghent, whose terms suggested that the war had accomplished little or nothing, nonetheless unleashed forces that significantly changed the United States in the years that followed. Having survived the war with no permanent losses, the country had new heroes, new symbols, new stories of patriotism, and a new sense of unity. Two of those heroes, Andrew Jackson and William Henry Harrison, later became presidents. Symbols from the war include Old Ironsides, Uncle Sam, and the Star- Spangled Banner. Most important, citizens had a new sense of confidence in their country and began to refer to themselves as Americans rather than as Virginians or Marylanders or residents of whatever state they lived in. 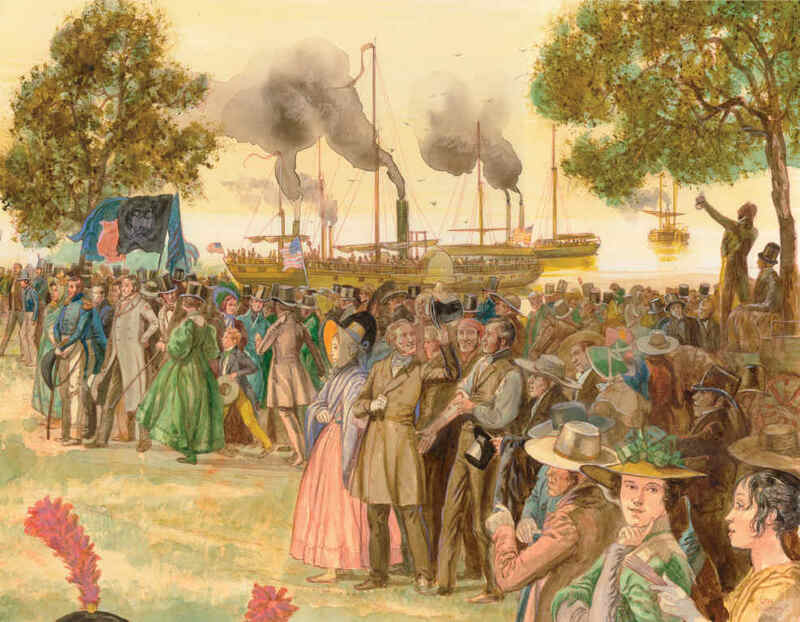 While issues of slavery and states’ rights continued to vex U.S. politics, an "Era of Good Feelings” after 1815 propelled the nation forward as the generation of the Revolution passed the baton to dynamic younger leaders. "The war has renewed and reinstated the national feeling and character which the Revolution had given ... The people ... are more American; they feel and act more as a nation; and I hope that the permanency of the Union is thereby better secured."